"A 65-year woman visiting Europe stepped off the bottom step of a van and collapsed. An x-ray revealed a nontraumatic fracture of her left femur. She had been experiencing a dull ache in her left femur for some months. The patient underwent placement of an intramedullary rod. One year later she developed a dull ache in her right femur. A bone scan showed a stress fracture in the right femur. 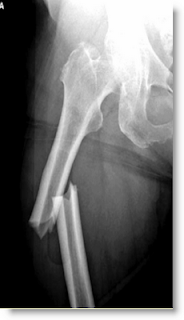 A bone specialist recommended prophylactic rodding of the right femur, which was done. The patient had been on alendronate for 9 years." If these drugs are so damn awful, then why on Earth do doctors keep prescribing these to men and women as young as in their 30's, why do Health Department officials keep taxpayer funding of them and why do drugs companies keep manufacturing them? This has to stop now! teh conventional medical system is overloaded, dr's need to dish out quick fixes like fosamax because there a major queue of other patients waiting to see them in their fifteen minute time slots. they don't have time to get a full evaluation of the patients lifestyle so it can be corected. as far as they are concernd, as long as you're taking hyour meat and three veg theres no other cure and if you're not taking your meat and three veg it would take to long for them to evaluate the patient properly to treat them any other way. from fifty known essential nutrients and probably more that are unknown your body has to mek 50-100,000 different biochemicals to work properly, shortages of just a single essential nutriant maginifies itself as your budy can't produce enough of numour different biochemicals to regulate itself properly, research is showing our cells ahve receptors for nutrients that until now have not been considered essential. eat a whole natural food diet, and not an extreme no fat one. or empty calorie one. you need serious nutrition rebalancing, ie megadosing on certain nutrients taht need to be identified through correct analysis, ie hair analysis to correct your imbalances, and the medical system will pump you full of drugs which will exacerbate the nutritional imbalance. When in hospital the appetite is usually very poor. Any food that enters the mouth needs to be especially dense in nutrients. Studies have shown that people with wasting diseases such as cancer fare much better when given frequent small meals of whey protein. The food served in hospitals is generally very poor in terms of real nutrients. My advice to people entering hospital for more than a few days is to arrange for nutrient rich meals to be delivered to them!